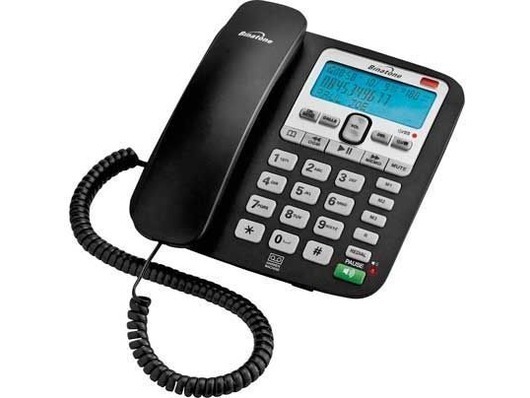 Binatone Acura 3000 is a combined big-button telephone and answering machine that successfully combines ease-of-use with a number of additional, useful features. Acura 3000's big button design and clear, backlit display make it the ideal choice for those with visual impairments who want a stylish phone for their home or workplace. The Acura 3000 has a modern black case with two-tone black/silver fascia and an attractive large illuminated display. The buttons are clear and well-spaced to aid dialling and the phone is fully hearing aid compatible to help those who are hard-of-hearing. The Acura 3000's integrated answerphone is simple to access and use thanks to well laid out buttons and a simple menu system. There are two pre-recorded messages to choose from or you can record your own personalised greeting. There is a 40 minute internal memory for saved messages and a remote access feature for reviewing your messages when you are away from home. A clear message counter lets you know when you have new messages and playback from the base unit is aided by a powerful internal speaker. You can, with the simple on-board controls, select the volume of message playback as well as that of the ringtone and hands-free speakerphone. There is an internal memory large enough for upto 120 names and numbers allowing you to store all your important contacts. The Binatone Acura 3000 has type II caller ID which will, if the number is stored in your contacts, display the name of the person calling. In the event of a new caller, their number will be displayed so you can decide whether to accept or ignore the call. Bought two for presents good phones for the price and excellent company service will use this company again in the future. Arrived on time took into account delivery instructions. Item works to specification as expected, enough said. Doesn't need a battery as required by other versions that I have had by Opticom. Ordered Tuesday pm, arrived Saturday (Friday was a pub.hol). Item as described and works, no more to say. Superb phone for the price. Had a small issue with it which was promptly resolved by the Seller. Overall, it is a great phone and the Customer Service is second to none. 5 stars!!! Quick delivery, easy instructions. very pleased. Quick delivery, easy instructions, very pleased. Bought as a stand-by together with a cordless trio.Good phone with a solid feel but you have to connect to power supply so that most of the features work ie.memory,speaker etc. so make sure there`s a wall socket nearby.Easy to mount on the wall with bracket that`s supplied in the box but no hardware.Very clear speaker and easy to operate but display could be a bit clearer when wall mounted. Otherwise a good buy. Great little Phone, good price, fast delivery. I made the right choice. Thank you. Very quick delivery. Excellent product with a very good price. Very good service and fast nice product at reasonable price tag. Great phone works well so far, shall buy from Cordless again many thanks Melvin. fast service, good product,easy to set up.Excellent company. Solid phone. Pleased with it. Order arrived very quickly. Would recommend both the product and the company. The Phone was as described and quick delivery, the Phone and the Answer Phone work well. I would definitely purchase from this company again. I would give this Company and Product 5 Stars. First class service,delivery super fast and the the phone is excellent. Phone arrived very quickly and looks very good value for money. I have not started using it yet as I dread the thought of re-entering all my diary telephone numbers-there must be a quick way of doing this? Prompt delivery. Good looking telephone with great features. Clear instructions and very easy to use. Only minor complaint is the rather 'tinny' sound when using the buttons. I can't give it four and a half stars so it will have to be a four. Really impressed with this phone, loud ring and clear line and easy to program with telephone numbers. Great price on this website. Swift delivery. I found this phone via a web search. I wanted a corded answer phone. Important features being: The handset cannot be misplaced (hence cord), no controls are on the handset and the answer phone messages and settings can be accessed from a remote location. Very few phones seem to offer this specification these days so I was delighted to find this one which is very reasonably priced. Delivery of the Acura 3000 was very fast, it was easy to install on my BT line, the operating manual is clear and logical, the phone's functionality and ergonomics are excellent and everything works as described. I cannot comment on reliabiilty since I have only had the phone a week. 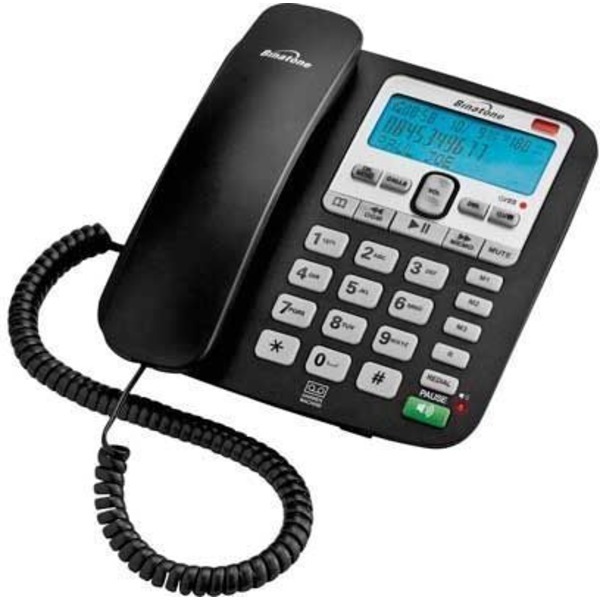 Needed to replace my old corded phone with answer machine and found this one from a google search- compared with other suppliers and found this one nearly hslf the price and the ordering and delivery top class! Plus the phone is pretty good too! Delighted, just what was needed. Brilliant service and fits very nicely in my home office. It has all the functions that I need and easy to set up/use. The phone came very quickly and is does everything I expected. Slightly irritating voice telling me that the answerphone is on/off is a very minor detail. Super little phone, just what I wanted. Still can't believe the price, & it arrived within 48hrs - Who could ask for more!! Great quality phone,easy to set up & really great value for money ! Very happy with my purchase, company were very fast to deliver it for me and it was a bargain. Thank you, would certainly deal with the company again. This is a great home phone with a good clear display and lots of features including answer phone built in, nice to use clear buttons, arrived very quickly and set up in a few minutes, excellent value for money. Very pleased with this phone. It arrived very quickly and was suitably packaged with all the parts (except possibly screws for the wall mount). The phone is very esay to use and the guide is simple to follow. The phone is very versatile with a number of functions and clear, adjustable display. It has a slightly plastic look and feel, but overall, the appearnce is is good with clearly legigible buttons. I would certainly consider buying a second phone at this price.